We offer a variety of training schemes for our Traditional Chinese Medicine and Tuina massage courses, in cooperation with a top Traditional Chinese Medicine health advisory service. Our internship programme offers intensive training in TCM and Tuina, either privately or in the clinic of a TCM doctor, getting the same standard of training as a local intern would receive; with certification at the end of the course for the different training levels received in the clinic’s Tuina system. We have several programmes, including an intensive two or three week course, in which the student trains five days a week from 9am – 5pm, working alongside the doctor as a trainee intern. (Monday – Saturday, Tuesday is a rest day). You will learn their complete Tuina system, covering full body acupressure massage, to detoxify, tonify and balance the meridian system. 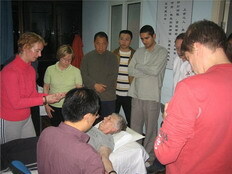 There will be hands-on practice with the head doctor as well as several of the other doctors working in the clinic, training in how to correctly identify the meridians and acupressure points and their functions; correctly massage, apply percussion and manipulate the various meridians; learn some basic background information about TCM and its diagnostic methods, plus have opportunities to apply the massage techniques learned. At the end of each course, you’ll be presented with a certificate to prove you’ve successfully completed each level of the internship programme co-signed by DDA and the clinic. The courses are open to complete beginners, as well as students who already have some training in massage techniques (e.g. western or eastern disciplines like Swedish or Thai massage, reflexology, aromatherapy etc), and who wish to benefit from the additional techniques to be found in Chinese Tuina massage, thus honing and refining their own massage techniques, improving their understanding of the way the body and energy works within TCM and include a new element to their own particular training. For students wishing to continue their studies following completion of all 3 levels of the intensive programmes, there is further clinical training, designed to perfect the?techniques, learn more about TCM’s diagnosis and treatment methodology, gain clinic time, learn more about tuina and body realignment methods and treat patients within the clinic. We offer a beginner’s course, to set students off on the basics of Tuina massage techniques, with a certificate at the end of the course to show that you’ve passed the first level of basic training in Dr Li’s Tuina system. Topics covered are Dr Li’s Tuina system for preserving and maintaining overall good health, tonifying the body and detoxifying the meridian channels. Over the 2/3-week course, students will learn massage and percussion techniques that cover massage of the Gallbladder and Liver Meridians (essential for detoxification and weight loss), the Bladder Meridian and Heart, Lung, Pericardium and Small & Large Intestine Meridians. They will be taught correct massage techniques and manipulation of acupressure points, correct application of?their own energy/effort during the massage and how to deliver the meridian massage sensitively and comfortably to the patient. In the?2 week course, most of?the same material will be covered, although it does depend on individual students' abilities; for quick learners they can still cover the same material as the 3 week course, but the depth of information offered in relation to diagnostics and case histories etc, will be a little less and the hands-on practice time less. For beginners, the emphasis is on learning to massage correctly, attaining the correct techniques, finding the correct points and the correct application of pressure throughout the massage, as well as?learning the meridian system and its passage throughout the body, plus be able to deliver the basic meridian massage system. Level 2 will build on the information learned in the level 1 course, refine and hone the massage techniques, plus combine specific massage techniques and manipulation of relevant acupressure points to alleviate and treat various ailments and conditions and promote recovery. ?There will also be an introduction to the basics of acupuncture, body realignment therapies and cupping techniques. Level 3 will build on the information taught in the level 1 and 2 courses, refining the massage techniques learned, plus include a variety of diagnostic techniques in Traditional Chinese Medicine, such as identifying specific illnesses from examination of the tongue and through taking and reading pulses etc. There may also be an introduction to acupuncture for those interested in this field. Following the completion of Level 3, students will be awarded certification to show that they have completed their training and have shown proficiency in the clinic’s entire Tuina system. For students unable to commit to weeklong courses, we also run classes by the day or weekend and can arrange special one-off courses or seminars. Beginners 1 week introductory course:? ? 5750 Rmb. 2-week internship programme: ? ? ? ? ? ? ? ? ? ? ?5500 Rmb per week. 3-week internship programme: ? ? ? ? ? ? ? ? ? ? ?5250Rmb per week. 2-week internship programme: ? ? ? ? ? ? ? ? ? ? ?5750 Rmb per week. 3-week internship programme: ? ? ? ? ? ? ? ? ? ? ?5500Rmb per week. 2-week internship programme: ? ? ? ? ? ? ? ? ? ? ?6000 Rmb per week. 3-week internship programme: ? ? ? ? ? ? ? ? ? ? ?5750Rmb per week. Daily classes:? ? ? ? ? ? ? ? ? ? ? ? ? ? ? ? ? ? ? ? ? ?1800Rmb per day. (A minimum of one week’s total training time is required to attain the certificate of proof of training).? Fees cover all training, interpreter’s fees, administration costs, daily box lunch, and certification. Payment should be made to Rose Oliver of Double Dragon Alliance, prior to the commencement of the course/class. An official fapiao can be issued on request. ?Queries or problems concerning any aspect of the course should be directed to Rose Oliver at the address above or by telephone. Thank you for your interest in our internship programmes and we hope that you will enjoy your training. Rose please translate this for me for Dr. Li and everyone at the clinic!!! It has been a while since we have been in contact. Hope is all going well and that you had lovely holidays. I have been back in America for the last 6 months and living in New Hampshire, USA doing some house sitting and just getting settled. As of December we have moved into Exeter, NH. A wellness center offering Chinese Medicine and Tuina specializing in Neurological conditions for children and adults.? It is fairly new and we work with other more severe conditions MS, cancer, chronic pain, etc. I am enjoying the work! I use the technique that I learned from Dr.Li and am having wonderful results, especially with MS. The neurologist, one of the founders, has MS and really is promoting Tuina. I thought Dr. Li, you would like to know that your work is international and is having positive results here in America. I think of everyone there often especially when I do the tapping on the Gall Bladder meridian. I think about coming back, hoping I could work with everyone again!!! I would like to stay in contact with you. The tuina course was held at Dr. Li’s clinic under his supervision and the guidance of some of his doctors. The curriculum covered the system of meridians and their major points, the different massage techniques, introduction to pulse and tongue diagnostic as well as moxibustion. ?I really appreciated the fact that Dr. Li took time every day to teach me on a one to one basis, covering both theory and practice.? The rest of the day I practiced that day’s assignment with some of the doctors who were available or was given a tuina treatment so I could familiarize myself with the various techniques. Being able to practice on different people and being “treated” by different doctors was a great help as I could compare techniques - and styles - and learn more in depth. I was also given the possibility of asking friends to come to the clinic, so I would have more opportunities to practice. Occasionally, due to the large number of patients coming to the clinic on certain days, when all the doctors were busy and there was no treatment table available specifically for me to use; I could then observe the doctors carrying out treatments, or Dr. Li would ask me to be present when he was treating a particular patient so he could explain the case and his diagnostic technique for that particular patient. I took that opportunity to ask many questions. I also used that time to study the textbook and the charts with the help of the translator. The ambiance at the clinic was most convivial and relaxed which made me feel very welcome and free to ask many questions. The Chinese students who translated for me were very helpful and diligent, trying their best to explain even some of the more specific medical vocabulary. Both Dr. Li and his assistants were very patient in their explanations, willing to answer any questions and I had no difficulty understanding or making myself understood. I really enjoyed the course and the way it was held. I must say however that my previous studies of anatomy and western massage combined with my being familiar with Taiji Quan, Qigong and Chinese philosophy were definitely a plus and enabled me to get the most out of this “crash course”.? I wish I could have had more time to continue this study with Dr. Li and his staff. Thank you so much Rose for organizing this course “specially tailored” for my needs with such competent teachers, in a very friendly and professional environment. Double Dragon Alliance Taiji & Tai Zu Classes? Our new weekly Taiji and Tai Zu Quan classes will begin in March 2015, and will be held on Wednesdays, Thursdays, Fridays, and Saturdays; from 7pm - 8:30pm on Wednesdays and Thursdays; from 6:30pm – 8pm on Fridays; and 10am - 11:30am on Saturdays. Fees: 150Rmb per class or 2500Rmb for the 20-week courses paid in advance. DDA Centre, Room 606, 6th Floor, Greenland Group Genesis Building, 18 Shunyi Rd, Putuo District, Shanghai, close to Cao Yang Rd junction. Nearest metro stations: Lines 3/4/11 Cao Yang Rd?station, 10 minutes walk; & Line 11 Long De Rd station, 3?minutes walk. Master Wang Ming Bo and Rose Oliver, along with DDA assistant coaches, will be the instructors for the classes, which are open to beginners, intermediate and advanced learners. The Taiji course will focus on Yang Style Taiji Quan, covering the Yang Style 81-step form as taught by Master Dong Bin and will run over 20 weeks. (Any breaks for public holidays etc, will be made up at the end of the course). The Tai Zu Quan course will focus on dan chao single movement training, walking line drills, fajing power discharge, and form,?and will run over 20 weeks. (Any breaks for public holidays etc, will be made up at the end of the course).? The classes will also cover Taiji theory, some basic foundation and breathing exercises to facilitate understanding of the form, push hands, applications, plus detailed explanation in English to help students understand the individual movements and their meanings. To register for the class or for further details, please contact Rose Oliver at our email address or on: 13564190544. We look forward to welcoming you to class! Cultural Events and Workshop Programme? Classes in carving and engraving, one of China’s most ancient art forms. Learn how to engrave your Chinese name onto your own personalized stamp. Learn Chinese handwriting, as well as the inside meaning, history and origin of the Chinese language from Ms Wang Xiu Hua of the Shanghai Mei Shu Jai Xie Hui (Shanghai’s Fine Arts Institute). Brushes and materials will be provided. Learn the skills of painting traditional Chinese animals, birds, flowers, mountain and water scenes and bamboo forests.? Learn about the history of and the methods of playing the various forms of Chinese instruments. of Peking and Kunqu Opera, the characters and meanings behind the movements and gestures of the various styles and types. 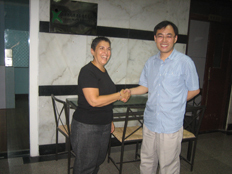 Ms. Cao Hui recently cooperated with Double Dragon Alliance at their Cultural Exhibition in 2011. Traditional Chinese Crafts (including Paper Cutting and Sculpture):? Learn the traditional skills of paper cutting and design. Learn the skills of Chinese clay pottery and sculpture. Courses are available in a wide variety of traditional Chinese martial arts, ranging from Taiji Quan to Hsing-yi Quan (heart and mind boxing) to Ba Gua Zhang (8 Trigram boxing) and Tong Bei Quan among others. Study with some of the highest level teachers and martial artists that Shanghai has to offer. Ranging from Qigong to Taiji Quan and Chinese Yoga; Chinese traditional exercise systems for health and longevity can assist everyone, no matter what age or state of physical fitness, to improve their health, maintain good levels of fitness and achieve peace of mind and relaxation. Especially important in this day and age, with our fast-paced lifestyles and busy schedules, these ancient forms of exercise will calm the mind, improve the body and give you a new lease of life! Train with top teachers in the Taiji and Qigong field, with expert instruction and translation. Doctor Li Yong of the “Conjoint Health and Advisory Centre”, a regular partner with Double Dragon Alliance at their seminars with the British Consulate’s Cultural and Education Section, as well as through their own privately run internship course; will provide introductions to the methodology and history behind TCM, as well as teach participants his system of massage to detoxify and stimulate the body’s meridian system and promote healing, balance and good health. Dr. Li’s patients include many of the staff of the British Council, after several took part in a Double Dragon Alliance TCM seminar and got to try out his Tuina techniques for themselves! An introduction to the ancient philosophy of balance and harmony within your environment. Learn about the origins of the art of Feng Shui and how it can affect your life, as well as how to re-balance and harmonize your home and work environment to facilitate a calm and healthy lifestyle, and improve business! With lectures and introductions into the diverse and fascinating philosophies that underpin Chinese culture. We offer a variety of learning courses, ranging from weekly classes over 10 week duration; seminars and workshops, designed to be “hands-on” interactive learning experiences, plus lectures for a larger audience. Our fees vary according to the type, length and duration of the course, the location, and particular client requirements; and prices range from around 350 - 500rmb for a weekly class, to up to 5000rmb for large lectures. Please contact our administrative office by email for further details or contact Rose Oliver on the telephone number below. Our previous clients include The British Consulate’s Cultural and Education Section, various schools and institutions as well as private individuals; and it is our continuous aim to offer great service, top-class instruction, value for money and a rewarding learning experience for all participants.? Generally all courses, including beginners, intermediate and advanced, last for 10 weeks, meeting once a week, with each class 2 hours in duration.? Class times will be scheduled to suit individual client availability and are by appointment. We also arrange supplementary courses for those wishing to review material taught in the course or who simply wish to continue their studies on a weekly basis. We can also organize shorter courses and small group talks. All materials for the courses, including brushes and paper are provided by DDA. Fees: Each 10-week course consists of once weekly 2 hour sessions. Fees are 200rmb per hour, or 3750rmb for students paying in full for the entire 10-week course. In the beginners’ course, students will learn the basics of holding and controlling the brush, basic brush strokes, building up to writing basic and commonly used characters and short phrases. Students will be taught to use specially designed “squared calligraphy” paper to aid in judging the correct dimensions of characters.? Aimed to build on the beginners’ course, students will be taken through more complex characters and sentences, plus start to practise writing on blank paper, without the use of the framed squares. Students may also be introduced to other styles of calligraphy. Students will learn other styles of calligraphy, including more ancient freestyle forms and running styles, plus learn to use finer brushes and paper and learn how to control the amount of water and ink to prevent “blotting” on finer rice paper. If you require any further information, please contact Rose Oliver for details. ?